It's been awhile since I tested a Air Hogs Micro Terrain Titans buggy, and I kind of missed having a truly micro-scale RC that I could drive around my desk during a quick break. When I was by the toy aisle at a local Target store and saw the new Thunder Trucks, my eyes lit up and my hands instinctively reached out and grabbed one before my brain could catch up and realize, "They've made Terrain Titans monster trucks!" 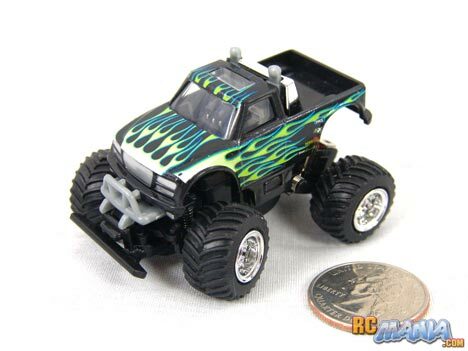 At right around 2 1/2" long, these are among the smallest RC monster trucks ever made. Available in four different body & paint styles, each one has working suspension at both the front and rear and "oversized" little tires made of a soft, high-traction rubber. Like with the Terrain Titans, the Thunder Truck's controller is a very small unit that doubles as a charger. It takes just 3 AAA batteries, making it really cheap to run. As with nearly all Air Hogs products, the controller doubles as a charger, and the Thunder Trucks use a simplified new plug that's both sturdy and easier to use than ever. There are no pins to line up, just a single square plug that a jack on the underside of the truck easily slides over. Push a button and the charge begins. About a minute later, you're ready to roll. The Thunder Truck can move outstandingly fast for a monster truck. It's pretty agile on a hard surface, and when you push the Turbo button on the controller, it really jumps up in speed and you can quickly run out of floor space! On a surface that's soft like a bed cover or low-pile carpet (though carpet isn't recommended since fibers & hair can get stuck in the axles), it slows down a modest amount, but what really suffers is the steering, which starts to struggle. What I was most looking forward to was taking the truck over some small-scale obstacles to test its terrain-handling capabilities. I was very happy with what it could go over, though I can't say it's as much of an improvement over the Terrain Titans buggies as I expected. What holds it back is that the motor is still geared for really high speed, instead of hill-climbing, obstacle-stomping torque. The truck can only go up a modest incline. Also, when going over obstacles, the steering is hit-or-miss. Depending on how the suspension flexxes or compresses, the truck might actually steer a completely different way than you want it to, just because it doesn't have the power to overcome the weight of the vehicle to turn it. It's still really fun to play around with nevertheless. It just sometimes takes multiple tries to get over some obstacles, and you may have to plan your route carefully for success. I really like that Air Hogs came out with micro monster trucks, but wish that the Thunder Trucks were better set up to handle their big tires. The lazy steering and speed-tuned gearing puts the performance about on par with the Terrain Titan buggies. That's not a bad thing to be compared to at all, but I'm just saying, they could have done better. For the price and the ease & speed of charging & playing, the XS Motors Thunder Trucks from Air Hogs are still a good deal, and can definitely be fun toys for kids & adults alike.